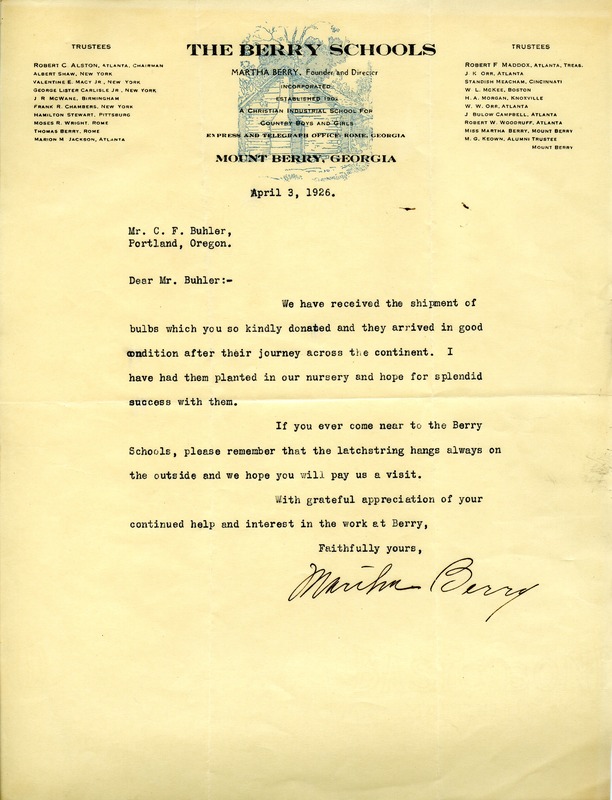 Letter to C. F. Buhler from Martha Berry informing him that they received the shipment of bulbs that he sent and that they were in good condition, even after being shipped across the continent. She informs him that she has had them planted in the schools' nursery and that she hopes they are successful. She informs him that if he is ever near to The Berry Schools that the latchstring would be on the outside and that she hopes that he will visit them. She then closes the letter by thanking him for his continued support and interest in the Berry Schools. Martha Berry, “Letter to C. F. Buhler from Martha Berry.” Martha Berry Digital Archive. Eds. Schlitz, Stephanie A., Haley Fortune , et al. Mount Berry: Berry College, 2011. accessed April 18, 2019, https://mbda.berry.edu/items/show/1004.